The New Year offers a traditionally new beginning that one creates for their self. Participating in a new year’s resolution can really support self-care, mindfulness, self-control, and improved self-worth. 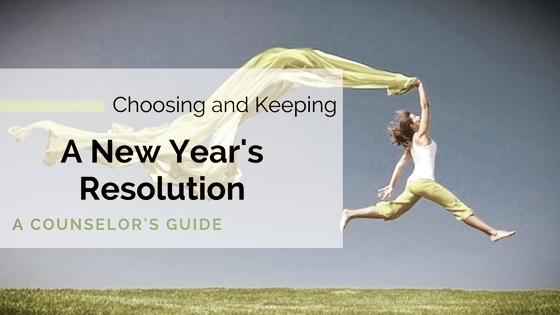 So how do you choose a resolution that you will keep? The same concepts that make up goal setting can be applied to New Year’s resolutions. First, find something meaningful to you. You can identify a larger goal and simplify it later. Next, spend some time thinking about how it might feel to accomplish that goal. What would you do? What would you think? Visualize reaching the goal. What does that look like? Make your goal realistic. It also helps to make it measurable. This is where the simplification comes into play. It’s not as much about choosing a realistic goal as it is about making the goal realistic. If your goal seems rather unobtainable, make a list of steps required to reach your goal then make step one your new goal. Create a support system. Talk to people you trust about your goal. Get people on board to help hold you accountable. Let them know supportive things they can do or say along the way…and specific things not to do or say. Maybe you can even find a partner to buddy up with on a similar goal. Just be careful not to make your participation contingent on theirs by setting that expectation with yourself. The cool thing about a New Year’s resolution is that the goal date is pretty much the end of the year. You can set other goals with specific deadlines, but those are different. Don’t overbook yourself though. Then, identify likely and perhaps unlikely barriers that may come up and plan ways you will overcome them. Practice positive self-talk! There are ways to reframe your thoughts in a healthier way. It’s not about lying to yourself, distracting yourself, or blocking thoughts. It’s about revising the thought in a way that supports the truth, but removes the hopelessness about it. Allow room for error and forgive yourself. Take small steps and praise yourself for incremental accomplishments. Basically, permit yourself to make mistakes. Forgive yourself when you do and direct your energy toward prepping your mind and body to pick up where you left off. Consider what you might tell someone you care about when they’re frustrated with themselves and speak to yourself that way. You have the whole year to get on and off track. Again, this is the neat thing about New Year’s resolutions. Forgive the time you’ve missed and take advantage of the time you have. Maybe there’s no longer enough time to reach your goal…modify it. The secret benefit from this process is to feel capable and accountable for improved mental wellness. The perk is reaching your goal.